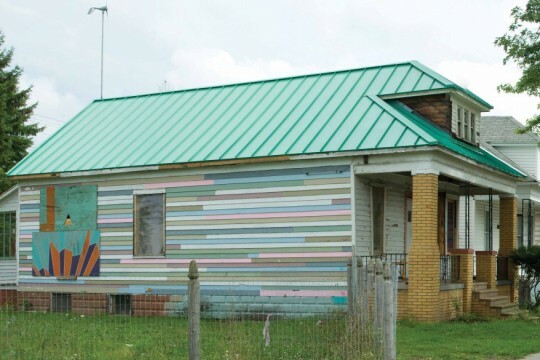 Architect Gina Reichert and artist/curator Mitch Cope of Detroit- based Design 99 use off-the-grid technologies to instigate change in their neighborhood. Power House encourages residents to turn abandoned homes into sculptures that double as supply sources of off-the-grid energy. The pair, working with Dutch group Partizan Publik, transformed a modest 1923 wood-frame house into what Reichert calls “a test lab of sorts for ideas and methods, low and high tech building systems, and a point of conversation for the entire community.” It is demonstration home for sustainable systems, a model for long-term economic investment, a bright spot in the struggling neighborhood, and a site for knowledge sharing on solar and wind power technologies.